The South San Luis Obispo County Sanitation District Board voted last week to increase a 10-hour a week administrator position to 40 hours a week at a cost of $12,500 a month. For the past seven months, John Clemons served as both chief plant operator and district administrator, at $800 a month for the administrative portion of his job. While the chief plant operator is responsible for plant operations, the plant administrator responds to board direction, sets agendas and oversees payroll. Prior to Clemons, Rick Sweet served as plant administrator working 10 hours a week for $4,000 a month. On April 5, the sanitation board voted unanimously to hire Gerhardt Hubner to work as the plant’s first full-time administrator. The district will pay Hubner, a geologist with a concentration in planning and water law, $150,000 annually or $12,500 a month. Hubner’s three-year contract includes a $350 a month car allowance, full medical, dental and retirement benefits along with a six-month severance package, should the district chose to sever its relationship without cause. From 1995 through 2005, Hubner worked for the Central Coast Regional Water Board as a project manager on the Unocal Avila Beach Cleanup Project. Hubner’s experience also includes work on the Morro Bay National Estuary Program, the Diablo Canyon Nuclear Plant and the Morro Bay Power Plant. For the past 10 years, Hubner served as the deputy director of Public Works Water Resources Division of the Ventura County Watershed Protection District. Wasn’t a previous administrator, Wallace, getting like $80,000 per month? I think some people’s bills are about to get a huge increase, they now have a very expensive dependent for life! Here is a link to the advertisement for the District Administrator position. 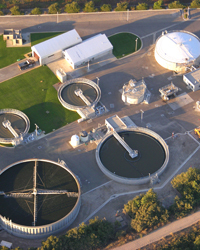 While Mr. Hubner is a high qualified individual, he has never managed a wastewater treatment facility. The salary you have agreed upon was not advertised for nor was the creature comfort of a $350 per month car allowance (does someone pay for your car to go to work? Not in my line of work, either). I do not know why this is a a three years long contract was necessary nor do I understand the fat 6 months severance, on top of very nice benefits. You have repeatedly been told you do not need a full time Administrator (the district has never had one) and with this contract you will not be able to get out of it without paying that severance when you realize the community is right and you really don’t need a full time Administrator. Perhaps you should rethink this entirely. The district has enjoyed competent administration for the last 7 months with Mr. Clemons at a very reduced rate ($800 per month with no car allowance). I, too, would like to see the analysis that concluded that the part time administration was deficient and that replacing a $800 monthly expense with a $15,000 monthly expense will make the plant run more efficiently and better serve its customers. I have no qualms about the qualifications of the new administrator; however, is this extravagance not equivalent to bird hunting with a Sherman Tank? Please stop reminding those who actually have to work for a living what the government pays for their workers. So depressing. Let me guess, some other bloated bureaucracy somewhere pays similar, so we better, too! Of course, I could be wrong, and that geologist degree with a concentration in water might make the big bucks in the private sector, and we have to lure this guy away from that choice private sector job, right? Only $350/month for a car?! Damn, that won’t even get him a Tesla lease. Probably have to settle for a Lincoln MKZ. Government employees deserve better! Kind of what I was thinking, you see many ads for leasing a basic brand new car for $150 -$200 a month, Shoals and Hill could have saved the rate payers some money by giving that lease amount and if Mr. Hubner wants something better he can pay for the difference himself, but clearly saving the ratepayers money is not on the minds of Shoals and Hill.